300 SB bonus when you sign up for Swagbucks in August – I am. Are you? 3. That’s it. It’s super easy, and Swagbucks is for real. I use it myself, and I’ve earned over $1200! This entry was posted in Points, Social Media, swagbucks. Bookmark the permalink. 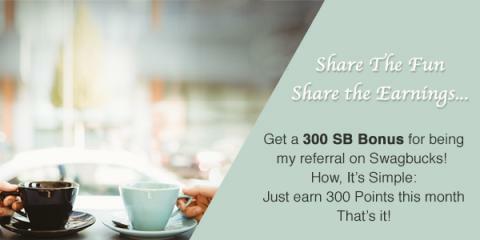 ← Get 300 bonus SB from Swagbucks in July!